A real-time, multidimensional, professional-development program that is connected to both practice and school culture was delivered to a group of Montessori teachers with the goal of improving teaching practices and increasing student success by exploring the potential benefits of mindfulness, structured reflective practice, and teacher-centered mentorship (i.e., clinical supervision), A case study of each participant and of the cocreated professional-development learning communities revealed that the program supported teacher growth and efficacy. Four themes emerged from participants’ experiences: the importance of mindfulness as a precursor to reflection and mentorship, the creation of communities of trust, the benefits of structure and focus, and the role of supportive accountability in improved practices. The study provides preliminary evidence for the use of multidimensional and teacher-centered professional-development programs to improve teaching practices. The research study has implications for administrators, teachers, and future research. Dr. Laura Saylor is an assistant professor in the School of Education. She earned her Ph.D. in Education Studies from The University of Cincinnati. Previously, she earned her Master of Education from Xavier University with a concentration in Montessori Education. Her 25 years of practical experience include teaching in inclusive and multi-age settings and serving as the Head of School for an independent Montessori school. Her research foci include reflective practices for educators as well as the effective preparation of early childhood teachers. Dr. Saylor’s interests also extend to best practices in mathematics and science education. Her teaching expertise includes educational assessment, math and science teaching methods, and collaborative work in education. Acheson, K. A., & Gall, M. D. (2003). Clinical Supervision and Teacher Development:Pre-Service and In-Service Applications. New York, N.Y.: John Wiley and Sons, Inc.
Begat, B., Ellefsen, B., & Severinsson, E. (2005). Nurses’ satisfaction with their work environment and the outcomes of clinical nursing supervision on nurses’ experiences of well-being – a Norwegian study. Journal of Nurse Management, 13, (3) 221–230. Carroll, M. (2006). Key issues in coaching psychology. The Coaching Psychologist, 2(1), 4–8. Carroll, M. (2009). From mindless to mindful practice: On learning reflection in supervision. Psychotherapy in Australia, 15(4), 40–51. Council of Chief State School Officers. (2011). InTASC Model Core Teaching Standards: A Resource for State Dialogue. Washington D.C.: Council of Chief State School Officers. Danielson, C. (2007). Enhancing Professional Practice: A Framework for Teaching. Alexandria, VA: Association for Supervision and Curriculum Development. Desimone, L. M. (2009). Improving impact studies of teachers' professional development: Toward better conceptualizations and measures. Educational Researcher, 38(3), 181–199. Dewey, J. (1910). How We Think. Boston: D.C. Heath & Co.
Falender, C. A., & Shafranske, E. P. (1912). Getting the Most out of Clinical Training and Supervision: A Guide for Practicum Students and Interns. Washington, D.C.: American Psychology Association. Furtado, L., & Anderson, D. (2012). The reflective teacher leader: An action research model. Journal of School Leadership, 22(3), 531–568. Glickman, C. D., &H Bey, T. M. (1990). M. Haberman, & J. Sikula (Eds. ), Handbook of Research on Teacher Education (pp. 549–566). New York: Macmillan. Guskey, T. R. (2002). Professional development and teacher change. Teachers and Teaching: Theory and Practice, 8, 381–391. Lincoln, YS. & Guba, EG. (1985). Naturalistic Inquiry. Newbury Park, CA: Sage Publications. Jennings, P.A., & Greenberg, M. (2009). The prosocial classroom: Teaching social and emotional competence in relation to child and classroom outcomes. Review of Educational Research, 79, 491–525. Kabat-Zinn, J. (2013). Full Catastrophe Living: Using the Wisdom of Your Body and Mind to Face Stress, Pain, and Illness. New York, Bantam Books. Kabat-Zinn, J., & University of Massachusetts Medical Center/Worcester. (1990). Full Catastrophe Living: Using the Wisdom of Yyour Body and Mind to Face Stress, Pain, and Illness. New York, N.Y: Delacorte Press. Meier, D. R., & Henderson, B. (2007). Learning from Young Children in the Classroom: The Art and Science of Teacher Research. New York, NY: Teachers College Press. National Board for Professional Teaching Standards. (2002). What Teachers Should Know and Be Able to Do. Arlington, VA: National Board for Professional Teaching Standards. National Staff Development Council. (2011). Standards for professional learning. Journal of Staff Development, 32(4), 41. Nolan, J., Hawkes, B., & Francis, P. (1993). Case studies: Windows into Clinical Supervision. Educational Leadership, 51(2), 52–56. Ohio Department of Education, & Ohio Educator Standards Board. (2007). Standards for Ohio Educators. Columbus, OH: Ohio Department of Education. Responsive Classroom. (2012). Responsive Classroom Assessment Tool for Teachers. Turners Falls, Ma: Northeast Foundation for Children. Rhoton, J., & Stiles, K. E. (2002). Exploring the professional development design process: Bringing an abstract framework into practice. Science Educator, 11(1), 1–8. Roeser, R. W., Skinner, E., Beers, J., & Jennings, P. A. (2012). Mindfulness training and teachers’ professional development: An emerging area of research and practice. Child Development Perspectives, 6, 167–173. Schussler, D. L., Stooksberry, L. M., & Bercaw, L. A. (2010). Understanding teacher candidate dispositions: Reflecting to build self-awareness. Journal of Teacher Education, 61(4), 350–363. Siegel, D. (2010). Mindsight: The New Science of Personal Transformation. New York: Bantam Books. Sparks-Langer, G. M. (1990). Reflective pedagogical thinking: How can we promote it and measure it? Journal of Teacher Education, 41(5), 23–32. Vygotsky, L. S. (1978). Mind in Society: The Development of Higher Psychological Process. Harvard University Press. White, E., & Winstanley, J. (2014) Clinical supervision and the helping professions: An interpretation of history. The Clinical Supervisor, 33, 3–25. Authors retain copyright and grant the journal right of first publication with the work simultaneously licensed under a Creative Commons Attribution Non-Commercial License that allows others to share the work with an acknowledgement of the work's authorship and initial publication in this journal. Authors can view article download statistics for published articles within their accounts. 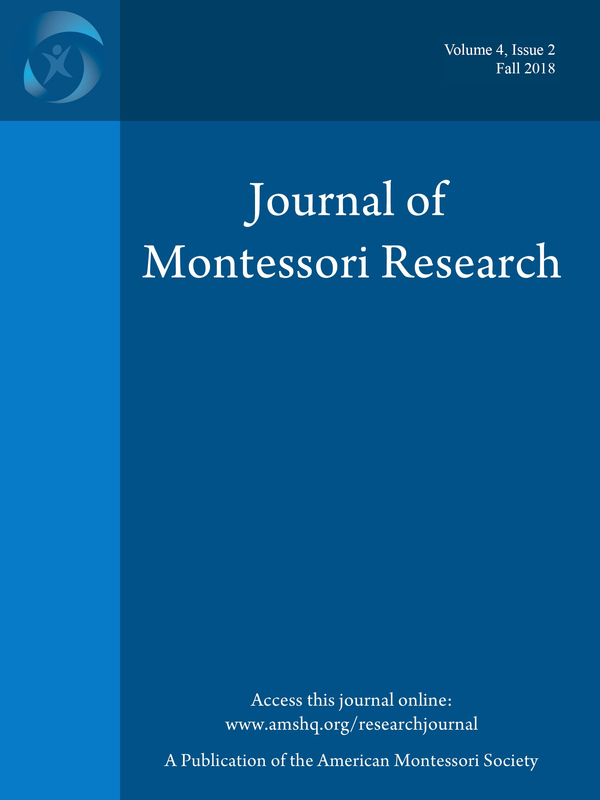 The following is an agreement between the Author (the “Corresponding Author”) acting on behalf of all authors of the work (“Authors”) and the Journal of Montessori Research (the “Journal”) regarding your article (the “Work”) that is being submitted for consideration. Whereas the parties desire to promote effective scholarly communication that promotes local control of intellectual assets, the parties for valuable consideration agree as follows. 1. An irrevocable non-exclusive right to reproduce, republish, transmit, sell, distribute, and otherwise use the Work in electronic and print editions of the Journal and in derivative works throughout the world, in all languages, and in all media now known or later developed. 2. An irrevocable non-exclusive right to create and store electronic archival copies of theWork, including the right to deposit the Work in open access digital repositories. 4. Copyright in the Work remains with the Authors. 1. When distributing or re-publishing the Work, the Corresponding Author agrees to credit the Journal as the place of first publication. 2. The Corresponding Author agrees to inform the Journal of any changes in contact information. The Corresponding Author represents and warrants that the Work is the Authors’ original work and that it does not violate or infringe the law or the rights of any third party and, specifically, that the Work contains no matter that is defamatory or that infringes literary or proprietary rights, intellectual property rights, or any rights of privacy. The Corresponding Author also warrants that he or she has the full power to make this agreement, and if the Work was prepared jointly, the Corresponding Author agrees to inform the Authors of the terms of this Agreement and to obtain their written permission to sign on their behalf. The Corresponding Author agrees to hold the Journal harmless from any breach of the aforestated representations. In consideration of the Author’s grant of rights, the Journal agrees to publish the Work, attributing the Work to the Authors. This agreement reflects the entire understanding of the parties. This agreement may be amended only in writing by an addendum signed by the parties. Amendments are incorporated by reference to this agreement.